At its annual conference for developers, Apple has revealed several ad-restriction related upcoming updates for Safari desktop browser. The most interesting one is the Intelligent Tracking Prevention. The purpose of this technology is to protect users from "third party" data collection. There often are elements on websites, integrated from other websites (images, videos, scripts, analytic services). If site B has elements from site A, the owners of the latter receive information about visitors of site B, even if they never visit site A. This is called cross-site tracking. As a result, a user does not know who has their data and cannot control it. In addition, aggregating and analyzing information from different websites gives vast opportunities of behaviour prediction and control. Apple's approach is based on giving information about users only to the sites they interact with and are interested in. So, if site A receives information about a user only as a "third party", through other sites, and the user hasn’t visited site A itself within 30 days, then the cookie files from site A get erased from user’s device and prevented from uploading again. If the user visited site A itself, then in the eyes of the algorithm he has more "rights" for tracking. But these rights are also limited: as a third party, a site can monitor the user only if the user visits it directly within the last 24 hours. It’s necessary in order to let people sign in to a website through an account from another site (for example, many sites can be logged in via a Facebook account). Apple is going to use machine learning to analyze the statistics about popular sites to determine which of them practice cross-site tracking of users and prevent them from storing cookies on user devices until it becomes known whether the owner of the device wants to interact with a site. Also, in the next version of the Safari browser, the autoplay of videos and audio recordings will be disabled by default. This will reduce the intrusiveness of promotional videos, but there is a less obvious effect on the advertising market. Autoplay is used not only for commercials but also for news, entertainment and other types of content. If a video starts automatically when the page loads, the analytics system often counts this for a view. High video views statistics on a site help the publisher raise advertising prices and attract more advertisers. However, it is still unclear exactly what changes in the market will the new function cause. Finally, the smallest update concerns the Reader mode in Safari. Articles will be opened in the Reader mode automatically by default. In this mode, the browser cuts everything that distracts from reading a text, — including ads and navigation elements, — allows choosing a font, its size, and a background color. The browser determines whether there are any articles on the page that can be displayed in this mode. Unfortunately, all these innovations relate to the new version of Safari for the desktop. Mac users will receive the update this autumn along with the new version of Mac OS called High Sierra. 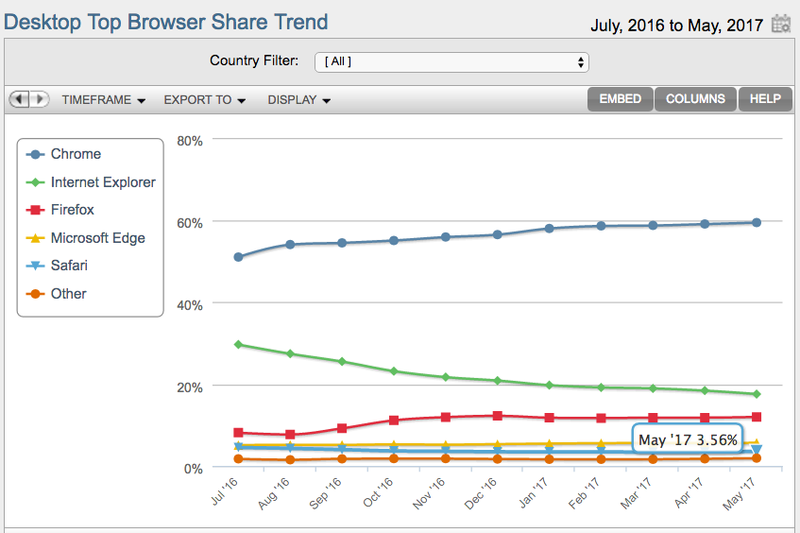 Desktop Safari now occupies 3.6% of the browser market. Google Chrome has almost 60% of the desktop market and 55% of the mobile market. But still, it's interesting to compare Apple’s and Google’s approach to advertising. Apple's business does not depend on ads, and Google's business depends entirely on them. In addition, Apple has always sought to fully control the user experience with its devices. It’s at the core of Apple’s DNA — not to encourage anyone to interfere with its products, change them and customize somewhat significantly. So advertising should seem to the company a rather rude interference in its aesthetics and the integrity of the user experience. For the same reasons, companies collecting and analyzing data are, first and foremost, competitors for Apple, because nowadays the more successful is the one with the most data. Apple’s participation in the advertising market is limited to the Search Ads program, through which developers promote their applications in the App Store — actually, it is one of the self-organization tools within its ecosystem. In 2010, the iAds platform and mobile ad network were launched for selling ads in apps, in 2014 Tim Cook called it "a very small part of the business", in 2016 it was officially closed. Google lives in a completely different world, heavily influenced by the "Unix DNA". For Google, attempts at customization and interference by strangers in their style and aesthetics are not critical. But the ability to serve advertisers is. The difference of essences generates a difference of strategies: Google seeks to become an "advertising police", prevent advertisers from getting too aggressive on users, and preventing users from completely shutting down advertising. And Apple is just interested in ensuring that advertising does not get in the way of users’ addiction to its devices. However, none of these strategies imply an opportunity to totally get rid of advertising. This can be achieved only by using a product specifically designed for the purpose. A new tool has become available in Google Webmaster — Ad Experience Report. In it, the site owner is to find screenshots and videos of ads on the site, which Google finds unacceptable and annoying by the standards of Better Ads. And since 2018 no ads will be shown in Chrome browser on the sites that do not comply with the Better Ads Standards (even ads owned or served by Google). Besides, Google launched a beta of the tool Funding Choices. It helps a webmaster to address users who block ads and ask them to either disable ad blocking or pay for ad-free access. Users can pay through Google Contributor, which acts here as a kind of adblocker, paid for users, voluntary for sites, compensating them profit losses from ad blocking and bringing profit to Google itself. It works like this: a user tops up his account, each time he visits a website that uses the Contributor, a per-page fee is deducted from his account to pay the creators of the website, a part of the money is kept by Google. The user sees no ads on the pages. We continue to tell the story of ad blocking. The first part was about first apps, anti-trackers, and the technology behind ad blocking. Now you can read about the fight against ad blockers, the attempts of self-regulation by the advertising market, and the birth of an ad blocker that sells ads.